I think that every employee, every manager, every director of a business or nonprofit should regularly take the time to answer the company phone and greet customers. Answering the phone may be considered an entry-level job, but it’s more important than that. It’s often the first contact between an organization and its customers – the people who are deciding whether to trust you with their business, or who already took a risk by choosing your product or service. Because most customers don’t call you when you do something right. The person who answers the phone is “safe” to complain to. You’ll hear honest comments and criticisms, such as no one called them back, or something didn’t work the way that it was supposed to, or someone wasn’t helpful enough. One of my first jobs was at a small company, and there were times when we all helped to answer the phone. By taking messages and sales orders, transferring customers to sales or technical support, and answering general questions, I learned how to listen when customers complained. Beneath the frustration and irritation, I heard them say that they cared enough to call us to work through the problems. Some of my co-workers even started transferring irate customers to me, instead of technical support. Managers and directors need to keep in touch with the people who use their products or services – who they are, the challenges they face, and what they need in order to trust you to solve their problems. And the best way to do that is by talking with them personally. 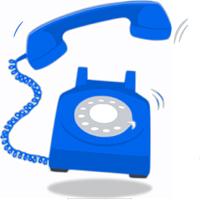 In fact, the customers who call to complain are a treasure to any organization, because they are giving you the chance to get it right. No matter what organization I work for or volunteer with, I hope that I always have the opportunity to answer the phone. Have you worked at a job where you interacted directly with customers and prospective customers? How did what you learned from your conversations help you improve your product or service? Museum Day is an annual celebration of boundless curiosity hosted by Smithsonian magazine. It’s a day we can learn about where we come from, who we are, and the shape of our future. On Saturday, September 22, 2018 participating museums and cultural institutions are opening their doors with free admission to anyone presenting a Museum Day ticket. There are 10 museums to choose from in Hawaii. Choose a museum wisely – you can download one ticket per email address. * Enjoy contemporary artwork by artists with a connection to Hawaii at the Hawaii State Art Museum (HiSAM), 250 S. Hotel Street, Honolulu, 10 am to 4 pm. * Immerse yourself in Hawaii’s royal heritage at the only royal residence in the United States, Iolani Palace, 364 S. King Street, Honolulu, 9 am to 3:30 pm. * Walk in the shoes of Japanese immigrants who sought better lives for themselves in Hawaii and celebrate the legacy of Hawaii’s own astronaut, Ellison Onizuka, at the Japanese Cultural Center of Hawaii, 2454 S. Beretania Street, Honolulu, 9 am to 2 pm. * Hear stories of Pearl Harbor and see bullet-scarred hangars, historic aircraft, modern jets and helicopters at the Pacific Aviation Museum Pearl Harbor, 319 Lexington Blvd, Honolulu, 9 am to 5 pm. * See life as it was 150 years ago in a restored Mission House built for New England missionaries David and Sarah Lyman in 1939 at Lyman Museum, 276 Haili Street, Hilo, 10 am to 4:30 pm. * Stroll through one of Hawaii’s earliest surviving sugar plantations, with a special exhibit about “Women Making History” and PAULO, the oldest surviving plantation locomotive, at Grove Farm Museum, 4050 Nawiliwili Road, Lihue, 10 am to 2 pm. * Experience missionary life in Hawaii at Waioli Mission House, 05-5373 Kuhio Hwy, Hanalei, 9 am to 3 pm. * Explore the rise of the sugar industry in Hawaii and its impact on Maui’s water resources and multi-ethnic culture at the Alexander & Baldwin Sugar Museum, 3957 Hansen Road, Puunene, 9:30 am to 4 pm. * Step into the past at the oldest still-standing home on Maui, a “missionary compound” built by Reverend Ephraim Spaulding at Baldwin Home, 120 Dickenson Street, Lahaina, 10 am to 4 pm. * Learn about the impact of Chinese laborers who built tunnels and irrigation systems and worked in sugar plantations and mills at the Wo Hing Museum, 858 Front Street, Lahaina, 10 am to 4 pm. Which Hawaii museum will you visit on Museum Day? What connections do you have with Hawaii’s history? I was excited to learn that we’re turning our attention to revitalizing the Ala Wai in Honolulu. 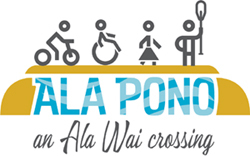 “Ala Pono: An Ala Wai Crossing” is looking at the ways residents and visitors move between the neighborhoods of Waikīkī, Ala Moana, and McCully/ Mōʻiliʻili. The goal is to make our community safer and more convenient for people, bicyclists, and motor vehicles, including emergency personnel. Pedestrian bridge. I can envision a pedestrian bridge spanning the Ala Wai. A beautifully arched white bridge, similar in architecture to the smaller bridges at Ala Moana Beach Park, could add a feeling of elegance and historic charm to the canal. Or a clear plexiglass bridge, an ala aopua‘a (cloud path), could connect land, water, and sky and create a sense of freedom and awe. But the “Complete Streets” project wouldn’t be complete without reimagining the Ala Wai. As it is, the canal is minimally landscaped and functional. But it could be so much more. Floating gardens. What if there were floating gardens along the canal? Aquatic plants could both beautify the canal and clean the water of carbon dioxide and algae. Hanging gardens. What if we created hanging gardens, with trellises arching over parts of the canal or growing along canal walls? This could enhance the open spaces, create more privacy, and clean the air of carbon dioxide and pollutants. Murals and sculptures. What if we built “art nooks” along pedestrian and bicycle pathways? By displaying the works of local Hawaii artists, we could give people a reason to leisurely walk or bike along the Ala Wai Canal, and something to talk about as they continue their journey. Canoe rides. What if we created a student-run program to offer canoe rides between the Waikīkī Public Library and the Honolulu Convention Center? The canoe rides could include a cultural component with Hawaiian history or music and chant. While I am hesitant to suggest commercialization of the Ala Wai, this could offer an alternate method of transportation while giving high school students experience in business, management, and hospitality. There are two public meetings this month at the Ala Wai Elementary School Cafeteria: on Saturday, September 22, 2018 at 1 pm and on Monday, September 24, 2018 at 6:30 pm. I encourage you to attend if you can, or share your ideas here and with Nicola Szibbo at nicola.szibbo@honolulu.gov. Do you live, work, or go to school in Waikīkī? What can you envision for the Ala Wai? There are so many worthwhile charities and nonprofits to choose from, but many of us don’t have a lot of money to donate. Or maybe we aren’t ready to make a commitment through a will or trust. We don’t have to wait until we’re “successful” or have a lot of money to support a cause we feel passionate about. You’ve probably heard of these ideas before, but here are four small ways to give that can have a big impact. Loose change. 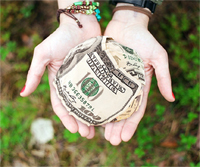 We can start small, by collecting loose change in a piggy bank and writing the name of a nonprofit on it. There are also bank accounts, debit cards, and credit cards that will “round up” our purchases to the nearest dollar and transfer it into a savings account. Birthday gifts. The older we get, the less we need – and the more we can buy for ourselves. Instead of buying a gift or throwing a party, ask family and friends to donate to your favorite charity or nonprofit. Some social media companies will help us create a birthday fundraiser, set a fundraising goal, and may even make a small contribution. Matching donation fundraisers. One of the easiest ways to make our donations go further is to contribute to a matching donation campaign. In September, we could choose the Foodland Give Aloha Campaign, which matches each donation up to $250,00 for all organizations combined. If we shop at Foodland or Sak-n-Save, we can make donations right from the check-out line. Golfers and golf fans might like this one: In November through January, we could choose the Aloha for Hawaii Charities Campaign, through the Sony Open in Hawaii, which gives charities a “bonus boost” if they raise at least $1,000 in donations. Changing beneficiaries. We can give a donation in the future, without committing to a specific dollar amount today. All we need to do is name a nonprofit as a beneficiary on a checking account, savings account, or retirement plan. We don’t need a lawyer, we don’t need to specify an amount, and we can change beneficiaries at any time. How do you give back to our community? Which charities and nonprofits do you support – and why do you support them? Recently, I attended my first annual conference with other affiliated members. I was tired from traveling, I was nervous about meeting new people, I was distracted about being away from my family, and I was worried about the work that was accumulating at the office. And yet, looking back, it was a wonderful and energizing experience. It was a beginning for me, the first time I felt grounded in my role at work. 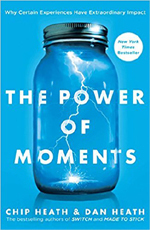 Exactly why brief experiences can be so memorable, and how we create defining moments, is the subject of Chip Heath and Dan Heath’s book, “The Power of Moments: Why Certain Experiences Have Extraordinary Impact” (2017). Short and engaging, focusing more on personal stories than research, the book examines defining moments and common traits. Elevation. They rise above the everyday. To create elevation, we should boost sensory appeal, raise the stakes, and break the script. For example, we might create a memorable First Day Experience to welcome new employees with a personal greeting, mentor, welcome gift, small group lunch, and email from CEO. Insight. They rewire our understanding of ourselves or the world. To create insight, we should dramatize a problem and let people discover the truth for themselves. Connection. They are social. To create connection, we should share big moments in person, communicate shared meaning, ask people what matters, and show responsiveness. Each chapter offers a whirlwind review and clinics that demonstrate how to solve real-world problems. Of all the moments, Doug Dietz’s defining moment resonated with me. As an industrial designer at General Electric, he designed a new MRI machine and had defining moment in which he saw that MRI machine through the eyes of children. Instead of a technology marvel, he began to see it as something scary and intimidating. So he re-imagined the MRI machine as an adventure, creating jungle, pirate, and cable car experiences that fired their imaginations. Are there experiences in our lives that we can transform with creativity and imagination? What is one defining moment that you experienced recently? Have you helped create defining moments for new neighbors, new co-workers, or new customers? You are currently browsing the Better Hawaii weblog archives for September 2018.